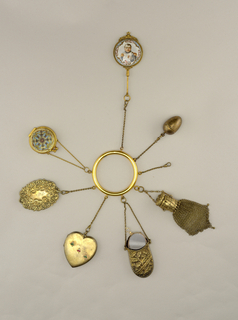 See more objects with the tag women, pendant , dangling, chatelaine. This is a Necklace. It was designed by Rachelle Thiewes. It is dated 1994 and we acquired it in 2016. Its medium is sterling silver, gold, carved slate. It is a part of the Product Design and Decorative Arts department. Thiewes’s introduction to jewelry was the long, swaying rosaries of the nuns at the school she attended. 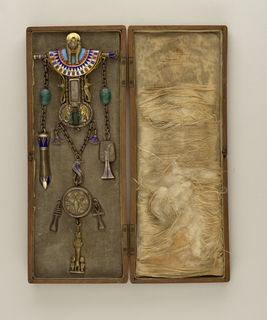 This necklace suggests a rosary or a woman's chatelaine, with its long chain and pendant ring of free-swinging forms reminiscent of keys and tiny accessories.